The Ryerson Students’ Union (RSU) board of directors voted to cut the remaining executives’ salaries by $11,000 each — restoring their salaries to last year’s levels: $36,000 per year — at an emergency board meeting called amid allegations of executive credit card misuse. Citing the credit card controversy, the board also voted to push back the upcoming RSU election so the student union can better prepare for it. The board called an emergency meeting on Feb. 1 after corporate credit card statements issued to RSU president Ram Ganesh surfaced. The statements, which were first reported by The Eyeopener, show purchases made at the LCBO, Toronto nightclubs and a credit risk management company, among others. At the meeting, financial controller Dharshini Jay said the student union’s corporate credit card purchases, which date back to May 1, amount to $273,000. Ganesh, vice-president operations Savreen Gosal and Jay have held corporate cards this year, but Ganesh told the Ryersonian that his and Gosal’s cards were cancelled in early January. RSU executives Edmund Sofo, Savreen Gosal and Karolina Surowiec at the emergency board meeting on Feb. 1 (Victoria McMurchy/Ryersonian). Ganesh did not attend the emergency meeting. Daniel Lis, the chair of the meeting, said the president did not attend for fear of his safety. Last week, Jay gave executives a deadline of Feb. 1 to reconcile their finances. During the meeting, Gosal said the executives who showed up to the meeting — Gosal, vice-president equity Karolina Surowiec and Edmund Sofo, vice-president student life and events — have since handed in all their receipts dating back to when they took office nine months ago. Vice-president education Salman Faruqi resigned earlier this week. Notices of motions to impeach the remaining executives were discussed. These motions will be brought forward at the next board meeting. Jay will have until Feb. 6 to look over the receipts and board members will be able to review the statements in full. In response to a question from the audience about whether students will be able to access the full statements, Lis, with direction from Jay, said that would be up to the board. The board later approved a motion to pay PricewaterhouseCoopers to conduct a forensic audit into the credit card expenses and “any other doubtful transactions” of Ganesh, Gosal, Faruqi, Surowiec and Sofo. “We do plan to investigate and look into what kind of action we can take for the best interest of the students, but as of now, a forensic audit must take place in order to solidify and confirm some of those receipts,” said Cristal Hines, a Faculty of Community Services director. “Students know what they want, but there has to be a process in place. We’re working to strike that balance so they get the answers to the questions they’re asking, but also that the answers are accurate,” said student groups director Maklane deWever, after the meeting. The board passed motions to ensure the financial controller is able to share information regarding finances to the board in the future and to call another emergency board meeting immediately once the report on the forensic audit findings is published. A motion to request a breakdown of LoudFest concert expenses and revenues, including an overview of how many free tickets and VIP tickets were given out, also passed. 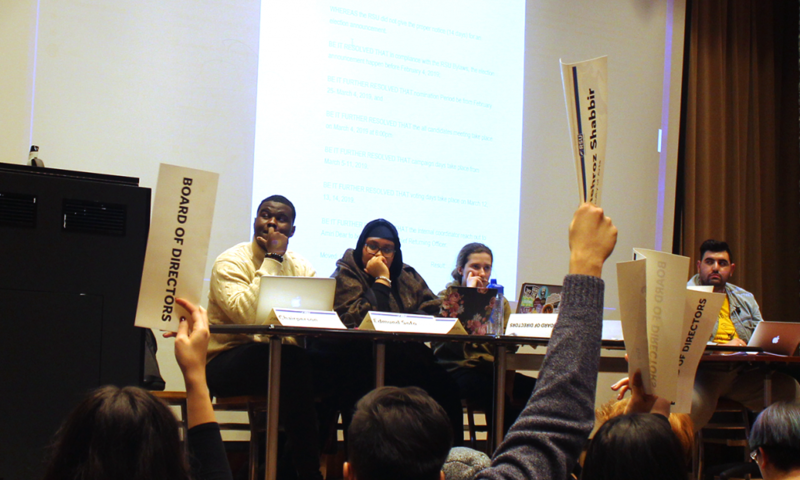 A motion to ban candidates running for board positions on slates was voted down. Hines, who spoke against the motion, said slates allow candidates to pool both their time and resources. The nomination period for the 2019-2020 RSU election will take place from Feb. 25 to March 4 and the campaign days will happen March 5-11. DeWever said the board pushed back the dates because they felt the RSU needed more time to ensure they are organized and elections are done fairly. The nomination period originally opened Feb. 1, the morning of the meeting. Adam Asmar, a fourth-year history student and former board member who attended the meeting, said that, at first, he was disappointed when the board voted to push back the election. “But then, after hearing there was no [chief returning officer] or elections committee, I feel a little bit more comfortable that the election is being pushed,” he said. DeWever said the important issue at hand currently isn’t currently elections, it’s the credit card statements. “I think that things will be much more sorted out [by mid-March] than they are now,” he added. Students will be able to cast their votes March 12-14. Ganesh previously told the Ryersonian he won’t be running for re-election.